In North Carolina, the concept of travel by steamboat was first introduced in 1815, when Archibald D. Murphey chaired a legislative committee on inland navigation. The first steamboat entered the state in 1818, when the New Bern Steamboat Company welcomed the arrival of the Norfolk to New Bern. The steamer was built in Norfolk, Va., the city for which it was named. Three weeks behind the Norfolk, the first steamer built in North Carolina was launched at Fayetteville by James Seawell. The Henrietta was a hardy 100-foot side-wheeler, with a 15-foot beam and a 4-foot draught. The ship could carry 100 tons of cargo and 30 passengers. 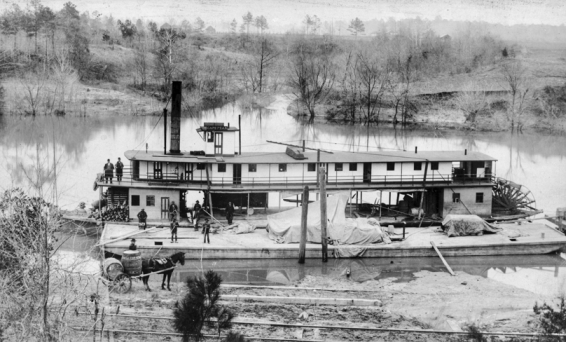 Seawell entered the business with a seven-year monopoly on steam trade between Fayetteville and Wilmington, a typical arrangement provided early steamboat companies by the state to encourage their business. The Henrietta was almost a prototype of North Carolina steamers. In size and shape, local steamboats did not change significantly over the next 100 years. They were built with a simple flat-bottom hull and usually two-story decking, the bottom for freight and fuel and the top for passenger cabins. A pilot house was mounted forward on the second deck; the engine and boiler rooms were below, one fore, the other aft. All were shallow-draught to accommodate the low waters of the state's rivers and sounds. The Henrietta was atypical only in its 42-year length of service. Most steamers had a much shorter life due to boiler explosions and other accidents that frequently sank them. The second steamboat built in North Carolina and the third to begin operations in the state was the Prometheus, a small stern-wheeler constructed at Beaufort by Otway Burns, naval hero and noted privateer in the War of 1812. The Prometheus plied the waters of the Cape Fear River between Wilmington and Smithville (modern Southport). The steamboat's small engine was no match for the strong coastal currents encountered at the mouth of the river, and the vessel was soon retired from service. Its most notable run may have been in 1819, when it ferried President James Monroe from Wilmington to Smithville as part of his Southern tour. Other steamboat companies, including the Old Dominion Line, Cape Fear Steamboat Company, and Lutterloh Line, were established in the 1820s and 1830s. Their steamers ranged in size from the 40-ton Union to the exceptional 460-ton Southern Star, built at Murfreesboro. Speed and tonnage were important factors in the competitive steamboat business. Vessels made slow time down the Cape Fear, Black, Tar, and Neuse Rivers, but they transported freight and passengers faster and more easily than wagons. Most North Carolina steamboats were 80 to 120 feet long, with a 12- to 15-foot beam. They were constructed without ribs, using instead side planking fastened by bolts. They were powered by 50- to 100-horsepower steam engines, and the majority were stern-wheelers, since they maneuvered better in the crooked and narrow rivers of North Carolina than did side-wheelers. The rivers were so twisting in places that lines were attached to trees along the banks to hand-pull or windlass a steamer around a curve. Steamboat technology improved as the nineteenth century progressed, but North Carolina generally stayed with what was known and trusted. Some midcentury steamers were more elaborate and could carry more cargo, but they essentially followed the formula initially set by the Henrietta. Wilmington increasingly drew the steamship trade to its docks in the second half of the nineteenth century. Not only local steamers tied daily to its wharves, but also foreign-built hulls from Britain and Europe called at the port city. The New York-Wilmington SS Line offered weekly passage aboard the Fanita, Pioneer, and Benefactor. In 1896 the North Carolina Board of Agriculture listed 37 steamship companies and owners that were registered in the state with an aggregate value of $289,000. Steamboats carried mail and passengers to the Outer Banks, opened commerce between inland cities and coastal ports, and brought foreign trade to the state. The cumbersome vessels dominated freight and passenger service in eastern North Carolina until the combustible engine brought roads to the coastal plain in the 1920s. Tucker R. Littleton, "North Carolina's First Steamboat," The State (November 1977). Thomas H. Sloan, Inland Steam Navigation in North Carolina, 1818-1900 (1971). Herbert S. Southgate, "Pioneer Skipper," The State (October 1985). 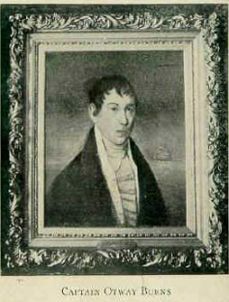 Otway Burns, privateer in War of 1812 and constructor of the Prometheus. Available from http://www.ncmarkers.com/Markers.aspx?ct=ddl&sp=search&k=Markers&sv=C-54 - 'PROMETHEUS' (accessed August 8, 2012). 1 January 2006 | Barfield, Rodney D.; Norris, David A.